What is the Ryan Russell Memorial Pipe Band Training Program? The training program is a non-profit venture by the Ryan Russell Memorial Pipe Band to provide quality piping & drumming training to new young players who are interested in joining our Pipe Band, and becoming a member of the pipe band community. How long will it take my son or daughter to become a member of the band? The progress of every student will be different, and really depends on the amount of work that is put into it. Some students may have some prior experience and others may naturally be driven and progress quickly. Others may require a bit more time to progress. On average, it can take anywhere from 8 to 18 months or more to get onto the pipes. Please note this is just a general guideline, and individual progress can vary! The first year requires developing the correct grip and basic movement of a drummer. Counting aloud, reading basic note values and marching skills for coordination are also part of the first year. The goal within the first year and definitely within the second year, is to learn some basic marching drum scores for use in parade and concerts. We will try to make the new player feel a part of the organization in the first year by having some junior band players join in the training, and your son or daughter can watch band practice (which is held after training). This process may be accelerated by supplementing the training program with private instruction. We can help you find a private instructor, if that is the way you would like to go. Progress will depend heavily on regular practice by the student on his or her own outside of the session – typically around 15 to 25 minutes per day. For pipers, there is an upfront cost of $108 for a practice chanter (if required) and $42 for an instruction book. Tuition fees are $395 for October to June (payable in two installments), or $280 for January to June. We operate on a non-profit basis – tuition fees are used to cover instructor and incidental training costs. Contact us – a deposit is required to secure a spot. See the Get Started page for more info. The Ryan Russell Memorial Pipe Band is a youth band for under-18, and ages 8-14 are the “ideal” range for beginners. Initial player development towards becoming a full band member takes around 2 years, and development towards becoming a great player can be a lifetime pursuit! Although no music training experience is necessary, it is highly recommended that the young person have shown a basic interest in music. Why sign my son or daughter up for the Ryan Russell Memorial Pipe Band Training Program? 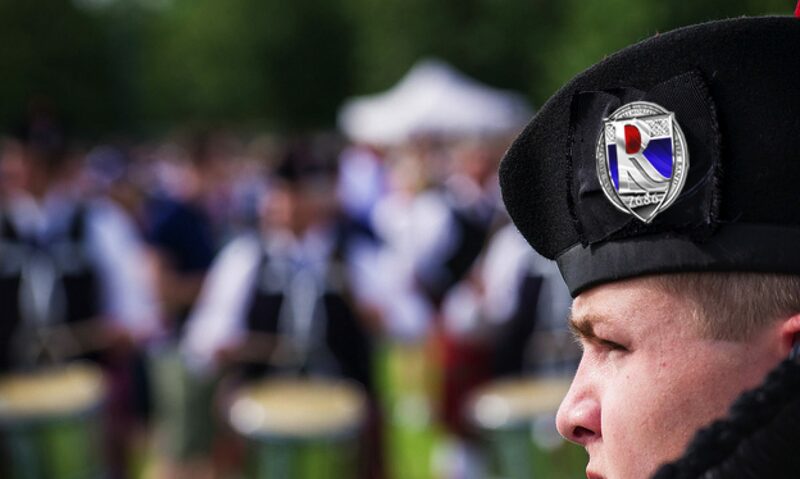 An excellent article by Andrew Berthoff in pipes|drums magazine entitled “For the parents” outlines the many benefits of getting your child into piping & drumming. We have two sessions for 2018-2019. The first session begins on Sunday October 14th 2018, and the second session starts on January 6th 2019. New beginners are welcome to join at the beginning of either session (note that space is limited). The sessions at Toronto Scottish Armoury, 70 Birmingham Street at 10am. See the Schedule & Directions page for more info.